The second book in GCC member Myra McEntire’s Hourglass series is out this month, and I have to say, it has one of the prettiest covers I’ve ever seen. Love it! (The wallpaper in the background almost looks like the stencil on my bedroom wall.) 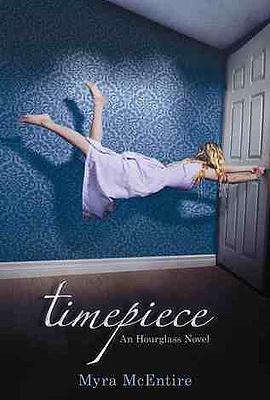 So if you’re looking for a book with a great twist on time travel, check out TIMEPIECE, out this month through Egmont USA. Myra: I’ve only been a bridesmaid once, and my dress was pretty sweet! Myra: I’ve based one character on two girls I know, and I’m actually getting ready to put two more into my third book, Infinityglass. Myra: They were both equal, actually. I was agented in about a month, and then once I went on sub, sold in about a month. In both cases, I am wildly blessed. Myra: One book I’m working on came from a place I used to play when I was a kid. I’ve tried to work it into so many stories, and I finally just found the right one! Myra: It’s a third book in the series, and I hoped it would sell, but nothing is certain. It took a long time from offer to signed contract, but I just signed it last week. Thank you, Myra! Now, everyone go out and buy books, lots and lots of books!